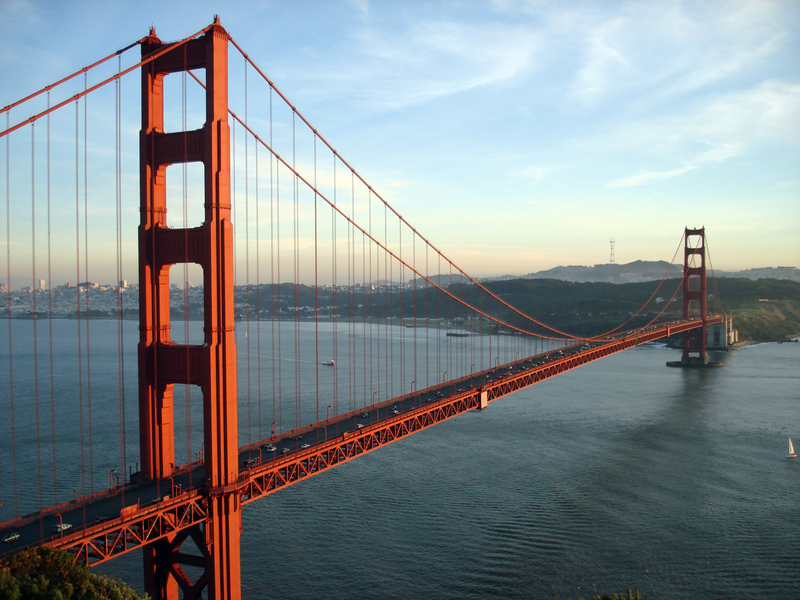 Our second day in Silicon Valley was quite standard ;-). It was actually equally amazing as our first day but it was quite standard for many founders here. First we spent some time with great cars, then we met up with several lawyers for some legal counseling on our startups. Finally we met with other founders to hear their stories. 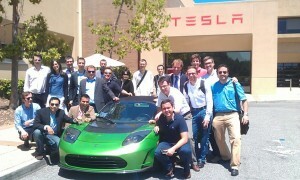 Our first visit today was one of the highly anticipated ones: we met with Tesla Motors. For those of you who don’t know; Tesla produces the Roadster, an electric sports car with a high range and an acceleration of 0-100Km/h in 3.7 seconds. Tesla was the first company to prove that a sports vehicle and an electric car can go together. We learned from Tom, the finance director, that this is actually just the tip of the iceberg and that there is much more to come. Personally I liked the fact that Tesla controls the entire value chain. This is quite contrary to what we’ve seen in most MBA cases. They own: design, manufacturing, logistics, distribution and retail. This allows Tesla to offer a complete experience and get feedback from customers back into the company in a very efficient way. Tom shared that when he worked in a retail outlet, he would sometimes call the engineer directly to solve a problem. I really liked this approach to create more value for the customer and also keep more of it in the value chain. After Tesla, we went to Dorsey & Whitney (D&W), a law firm in Palo Alto. D&W has offices all over the world and serves many industries. We had a lunch with them where one of their partners sat down with a couple of students. 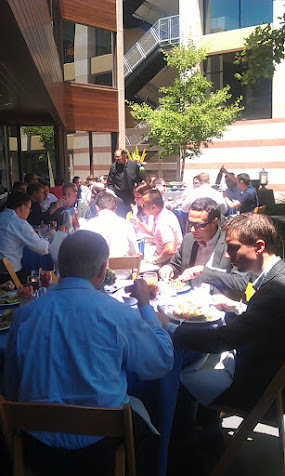 During the lunch I learned that there are two things very important for startups. Firstly, the founding team needs to agree on how the company is founded, owner ship split etc. They need to agree on these things at the very beginning “while they are still friends”. If later something happens and they are not friends anymore, they can fall back on what they agreed before. Secondly startups underestimate the power of Intellectual Property (IP). For a reasonably low fee a startup can file for a patent that allows to work on the idea for one year before the actual full patent is filed. This low fee thus helps secure a part of the IP of a company and protect it for the future. Overall it is just good to think about these things at an early stage when they are often overlooked. It can save a lot of pain in the future. We closed the day with a tour of San Francisco and then a dinner with some Founders. The dinner was very relaxed. I hear the experience of an entrepreneur that started two companies in Mexico in 2000.